If you are looking for the new India, New Delhi's Khan Market is your place. Even in the middle of a weekday afternoon, it's bustling with college students and young professionals crowded around its creperies and coffee bars. The magazine stall stocks GQ, Marie Claire and People with Indians on the cover. But right in front of it is a donation box. The sign reads: Donate Older Persons Need Your Help. "We have expressions in India like I was thinking about you, you are going to live a 100 years," says Himansu Rath who runs Agewell Foundation which puts those donation boxes all over New Delhi. "But in spite of that, because of economic changes, old people are being made to feel redundant." You can choose a culprit the economy, migration, globalization, television or just changing times. 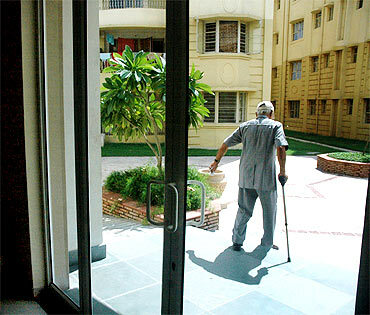 But as Indians boast about their rising GDP, seniors are increasingly feeling left out of the picture. The irony is while the new India (and its markets) are obsessed with its youth, old India is growing rapidly. Over 8 crore are over 60 in India today. By 2050 a quarter of the population will over 60. "The biggest increase has been in the category of 80 plus," says Matthew Cherian, CEO of HelpAge India. India's own prime minister is pushing 80. As is the just retired leader of the opposition. The well-being of senior citizens is written into Article 41 of the Indian constitution. For ten years there's even been a National Policy on Older Persons. But that's on paper. An inter-ministerial committee was set up to implement the national policy. It has met only four times in the last ten years says Cherian. "We are not keeping pace with anything," says Dr A B Dey, head of geriatric services at the All India Institute of Medical Sciences in New Delhi. "We are supposed to have two national institutes of aging and programs in every state. But things are slow." Dr Ira Ray, additional director general of health services with the government of India, helped start many of the government's programs for seniors. She says like all countries India had to juggle its priorities. "The big emphasis was on infant mortality and family welfare. Then were the programs to eliminate infectious diseases. So geriatric services always had lower priority," says Ray. "After all the kitty of resources is the same." But as life spans have increased there are more detected cases of Alzheimer's and related dementia. "We didn't have words for it," says Cherian from HelpAge. "In the villages of Haryana people would say they had turned into vegetables. They would lie on their charpoys [rope beds] and just wither away." 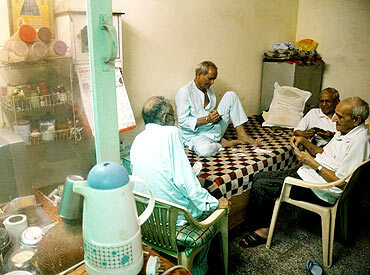 Most old age homes in India do not even accept patients with dementia. Hospitals don't know how to care for them. "It's a hidden problem," says Prem Kumar Raja, secretary of Nightingales Medical Trust which provides medical services for seniors in Bangalore. "People don't like to talk about it." Nightingales has a dementia day care center and hopes to open a comprehensive dementia care center in 2010. It will be the first in the country. Raja estimates there are 3o lakh people with dementia in India right now, 30,000 in Bangalore alone. Of course India is not alone in the developing world in grappling with a growing graying population. China has 160 million seniors. "But China has the money to photocopy the American model," says Dey at AIIMS. China's older population is increasing by eight million ever year says Wang Xiao Yan, director of Community Alliance in Beijing. It has about 40,000 nursing homes with 2 million beds. India, says Dey, lags far behind. Economists have warned against a 'gray crisis' looming in many countries because they have fewer and fewer young workers to support a growing number of seniors. But that is not yet such a problem in India says Sarah Lamb, professor of anthropology at Brandeis University and author of White Saris and Sweet Mangoes: Aging, Gender, and Body in North India. India, unlike Japan or Italy, still has a fairly high fertility rate. "Times are changing but there is still not a shortage of family members to look after the elderly," says Lamb. "There's really only been a modest increase of elderly living alone." Lamb says even those who have moved into old-age homes are learning to adapt, mapping the ancient Hindu concepts of renouncing life and moving to the forest to these times. "Some say the old age home is the modern forest. It helps us cut the ties of maya [illusion]," says Lamb. But Dey at AIIMS says the Hindu concept of rebirth can also be an obstacle. He says religions like Christianity and Judaism give importance to every part of life including old age. 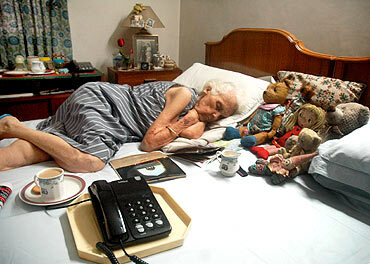 "Here you can offer the best care to a sick old person and he will say why prolong this life. Didn't the Bhagavad Gita say that is a rotten body and the soul needs a new home?" The problem for India is not that there are 80 million older people. The real issue is a lack of infrastructure and financial insecurity for a huge number of elders. There are 22 million widows in India. That's bigger than the population of New York. "The problem is not about widowhood and not eating fish. Many of them have been widows for 20 years," says Ruprekha Chowdhury who is doing her dissertation on old age homes in Bengal. "The problem is they have no savings." According to a 1996 survey, 64 percent of elderly women depend on others for food, clothing and shelter. "Widowhood, age and gender, it's a triple disadvantage," says Indrani Chakravarty, director of Calcutta Metropolitan Institute of Gerontology. She runs a day care center for poor elders. A handful of men come to the center but at lunch time the room is a sea of women in white saris. Many of them have walked for an hour through slushy roads to get there. "At least the doctor comes once a week here. We get medicines. Umbrellas in the rain. Blankets," says Shanti Mistry who has been coming to the center for seven years. She has acute spondylosis. "If people looked after us at home we would not come." Even middle-class elders often do not have money saved up for old age. Pensions are few. Health insurance is not common. Migration, whether to the West or to big cities, and smaller families means there are fewer children around. Cities aren't age-friendly. There might be wheelchair ramps but no rails to hold on to. "Aging came to India before development," says Indira Jaiprakash, a gerontologist in Bangalore. "In Western countries they developed first and then longevity came." But the biggest issue is most older people are not really prepared to enter this new world of old age. "They didn't see their parents live to be 75," says Himansu Rath at Agewell Foundation. "You could say this is the first real generation of old people." And they need to step up and demand their rights. So is it time for an American Association of Retired Persons-style organisation in India? "That's still a ways away," says Rath. "Old people still deny themselves. You ask your father for Rs 3,000 to buy jeans and he will give you the money. You ask him to buy himself two undershirts. And he will say no need. That attitude needs to change first." No discussion about aging in India is complete without a lament for the collapse of the extended family. 8.1 crore Indians are over 60 today. The population above 80 is growing the fastest. By 2050 according to UN estimates 4.8 crore Indians will be over 80. As India grays, nostalgia for the extended family has become a national, middle-class obsession. Baghban, a five-handkerchief Bollywood hit starred yesteryear's superhero Amitabh Bachchan. Once famous for the rebellious 'angry young man' roles, Bachhan now plays an aging patriarch. He and his wife are shuttled back and forth between their busy children, unable to live together any more, stealing tender moments secretly by telephone late at night. The breakdown of the extended family has become the arch villain in the story of growing old in India. "Until the 1990s there was strong family support," says Premkumar Raja, secretary of Nightingales Medical Trust in Bengaluru which provides medical services for elders. "Elders were taken care of in the family. But with globalization the joint family system is breaking. "But the past was never quite the golden age of happy families. "There was tremendous distance between generations. Different generations even ate at different times," says Mala Kapur Shankerdas, a gerontologist in New Delhi. "Now at least you see the whole family sitting together at the dining table." "There were always family tensions," says Lamb, author of Aging, Gender, and Body in North India. "There were old people being kicked out by their children. It's just that now you blame it on modernity and globalization." But the extended family was regarded as the amulet to ward off the ultimate horror a lonely old age. In its decline, its potency has become even more mythical. Lawrence Cohen, author of No Aging in India, remembers attending a session on old age at a conference in Zagreb in 1988. An anthropologist from India was presenting a paper about the long lives of elders in a remote Indian hill tribe. When he was questioned about dementia, the anthropologist was confused. In his hill tribe, there was no senility he explained. The joint family was still intact and therefore old people did not become senile. When Aloka Mitra was starting a shelter for aged women in the 1970s, government officials were indignant. "You ladies have nothing better to do and so you are thinking up all these problems in our society which don't exist, they told her," recollects Mitra. Mitra started Naba Nir, a home for older women in Kolkata. Now she is older than many of its residents. But she still calls them mashimas (aunties). "In a way they recreate the joint family here," says Mitra. She says she knows several old ladies who went back to their sons but returned to Naba Nir within a year. "I said what happened to you? Did they ill treat you? They said no, no, I just felt so lonely and neglected. I was just alone all day without a word to say to anyone." The Indian family is struggling to take care of its elders. Dr.Irudaya Rajan, professor of development studies in Kerala, says he knows a woman who had saved up money for her daughter's higher education. But then her father suddenly needed bypass surgery. But two weeks after the operation her father died. "She was so upset," says Dr Rajan. "She said if my father had died two weeks ago my daughter could have gone for her studies. She was angry with the dead father." The strains are manifesting themselves in rising levels of elder abuse say advocates. Mostly it's neglect. Elders are ignored, confined to a room, with no one to speak to. Hiren Mehta is the program manager of the Harmony Center. He says he visited an affluent old age home near Mumbai. An old lady with cataracts mistook him for her son. "Her son had dropped her off six years ago, paid the money and promised to visit every day," says Mehta. "He never came back." Sometimes it's physical abuse. Gauri Nandy, a worried looking widow in her 70s says she sought out a home for the aged after endless wrangles with her sons about their property. "They wanted me to sign the house over to them," she says in a hushed voice. "I would not. They pushed me down and I hurt my leg badly. I had to go to the hospital." 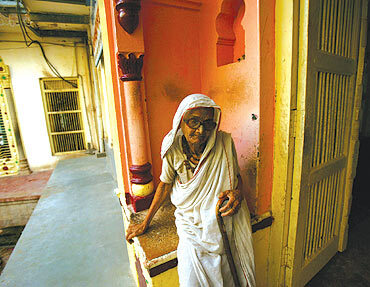 She now lives in Naba Nir, the home for aged women in Kolkata, sharing a dormitory room with a dozen other women. She keeps a little potted plant by her bed to remind her of the garden she left behind. "Elders need to be respected," says Nandy. "Do we now have to teach that?" What India's seniors are having to learn instead is that the balance of power has changed in the household. India's economic progress has meant that children often make more in their first jobs than their fathers did in a lifetime. "Earlier in the Bengali family the fish head went to the grandfather," says Himansu Rath, who runs the Agewell Foundation in New Delhi. "Now it goes to the grandson." The grandparents are feeling increasingly squeezed out of their own homes. "We even have cases of abandonment," says Mathew Cherian who runs the Indian branch of HelpAge in New Delhi. "Children just leave their parents in other parts of the city where they get disoriented." The government is getting so worried about the fraying family networks there is now even a law on the books that requires children to take care of their parents. China passed a similar law in 1996 says Wang Xiao Yan, director of Community Alliance in Beijing. "This has created a strain on the working population, particularly children of the one-child policy," says Yan. In India few actually want to take advantage of the law. "We believe that when you die your son must perform the last rites. So you don't want to complain about your son," says Agewell Foundation's Rath. But there is a huge sense of guilt on the part of the sons in not being able to look after aging parents. When Cherian of HelpAge reunites parents with the children who dump them, they take them back. "There is social pressure," he says. "The neighbors say oh look at these children, they left their parents on the road." Some elder advocates, however, say it's pointless to just demonize the children. Shankerdas, the gerontologist in New Delhi says Indian families thrive on "a culture of dependency." "The elderly are quite happy to be dependent," says Shankerdas. "That means you don't learn to do day to day things, like banking and bill payments." Usha Vatsare runs Yogakshema, a rehab and wellness center in Bangalore. "The younger generation is too busy to take care of the elders," she says. "But the elders are rigid and inflexible and can't get along with their children." While Indians love to talk about family values, Vatsare says relationships are mediated less by love and more by duty and obligation. Children, especially sons, are considered an investment. "I look after my son and my son will look after me in my old age," says Indira Jaiprakash, a gerontologist in Bangalore. Now the return on that investment feels up in the air for many Indians. But despite the problems, elder advocates say the solution is not an old age home in every district or more Western-style retirement communities. Premkumar Raja at Nightingales Trust says what India needs are more day care centers. "We don't want to separate elders from their families. We feel daycare is the answer." Nightingales has two day care centers one for poorer elders and one for the middle class. They tried to have just one, but in India class taboos are too strong for both classes to mix. Jaiprakash agrees that day care center can give families some breathing space. The family, she says, is adapting as well to the pressures and demands of the 21st century. Children may not live with their parents. But they live near them, perhaps upstairs in a separate flat. Sometimes parents even live with their married daughters. "New forms of family are emerging," says Jaiprakash. "You can't really write the obituary of the Indian extended family just yet." A job exchange for senior citizens!